300 pupils with a wide range of abilities, mostly from years 5 and 6, together with about 50 teachers, teaching assistants and other adults. 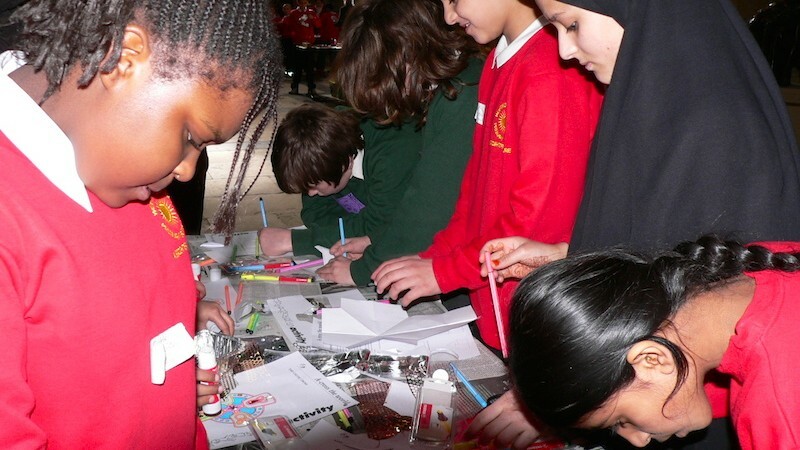 Pupils were drawn from 14 schools in rural and urban locations, mono and multicultural settings in the north of England. One disabled pupil was in a wheelchair. A working group of teachers met to carry out detailed planning on risk assessment and activities. In preparation for the concluding event, one school designed and made a large butterfly which acted as a focal point. The day focused on sharing commonality and respect for difference. After a formal welcome by the Dean, children moved into groups to participate in a carousel of workshops. The art workshop explored symbols and meaning in the three Abrahamic faiths. Pupils learned about and created symbols which were attached to banners for a parade at the concluding celebration. 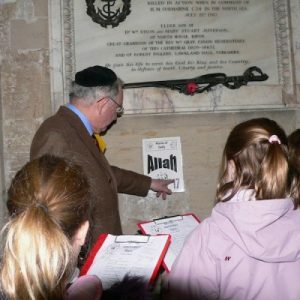 Members of the Muslim, Jewish and Christian communities were present as a living resource to support a faith trail where pupils learned about and from the three faiths. In the music workshop, children were taught two songs, one in Hebrew. The concluding event involved all participants. The parade of banners enabled the children’s work to be celebrated. Members of the three faith communities sang or said prayers in their language of worship. These were also translated into English. Songs on the theme of brotherhood and friendship taught in the morning workshop were sung. A group of adults with learning difficulties from the Jennyruth workshop joined the final celebration to be thanked for their contribution to the project. They made wooden butterflies given to all the children on leaving the Cathedral as mementos of participation. The project evaluations were overwhelmingly positive. They included comments about the growth of confidence and self-esteem amongst pupils. There was a feeling that seeds of tolerance were sown and an affirmation of the ways in which the participating adults worked together. Many, both children and adults, had made new friends. There was pride amongst the children hearing prayers from their own faith and a recognition that the prayer was fully inclusive – one could observe and listen to people from different faiths praying, but not have to participate.